If possible, at the first visit for a child, we like to keep everything short and easy. It can be a very strange experience for them, with new people and surroundings to absorb. We try to keep our appointments strictly on time, so that there is minimal waiting. Ideally, the first visit should be used to meet your child, to give them a ride in the chair, and to make a simple examination. We may talk to them about brushing their teeth and the type of foods to eat. Please arrive 10-15 minutes before your child’s first appointment to fill out the medical history form. You will be asked to tell us of any medications they take, as this often plays a part in their dental treatment considerations. You may prefer to print our form, so you can easily fill it out at your convenience at home. The medical history form includes our financial and privacy policies. You can download the form here and bring it in to your child’s appointment if this is easier for you. We will need one form per person. Unless there is something urgent, the simplest procedure is introduced first e.g. polishing their teeth, taking X-rays, temporary fillings. Over subsequent appointments more difficult treatment can be attempted. So much depends on the age, maturity, and past experiences of the child. All children have different needs and capabilities that have to be recognised, It is a matter of assessing them as we proceed, because we do not want your child to feel pressured. Whilst we need to know what your concerns are for your child, and what you would like to achieve for them, please understand that above all else, this must be a positive experience for your child, and we may have to be flexible. Children’s teeth are very different to adults’ teeth. They have a weaker structure, and a thinner protective enamel layer. They are therefore more likely to decay and harder to fix. By the time decay is detected, it may have damaged a very large portion of a baby tooth. This means that different materials, techniques and strategies may be used for children. The 1st adult molars come through at the back at 6 years old. Many parents are shocked to find that the cavity they spotted at the back is actually in an adult tooth molar, not a baby molar. These 1st adult molars are the most important teeth we ever develop. It is not uncommon to see decay in these teeth and have to treat them with root canal therapy and a crown in some children, or to extract them. We usually need to give local anaesthetic for most children. Most children can tolerate it very well, and then we can all relax during the rest of the treatment. Numbness of the mouth, especially a lower lip, can be an unusual experience for many children. Please remind your child not to bite or pinch the numb lip (or tongue) and ensure you supervise them until the numbness has worn off. In the event that your child does bite the lip/tongue, an ulcer and bruise will develop and can be quite painful. For aesthetic reasons, white fillings will be used wherever possible, but they require a completely dry operating area in which to set. This can be a big challenge in a small mouth with a wriggly tongue, so sometimes silver amalgams are used. Stainless steel crowns are often placed to protect the entire tooth from developing further decay. This preserves the teeth until they are ready to be naturally lost. Appointments are usually kept quite short. There is only so much time that children can stay comfortably still. They generally have short attention spans, and the muscles controlling their mouth become easily exhausted. LA is not always used solely to block potential pain. Sometimes we might use it to reduce the vibrations from the drill, or to make the child feel more relaxed that they truly won’t feel pain. Often it may be given for a small cavity where pain is very unlikely. This can act as an introduction and test for a more difficult procedure planned for another time. It is called desensitizing. “Happy Gas” or “Laughing Gas”. This is a very effective treatment for some children, and is often given in addition to LA. It is extremely safe, and acts only to relax the child, not to sedate them. It reverses quickly at the end of the appointment, and the child can walk unassisted after a few minutes. It will also make them think that the appointment was quite short. However, in young children, the nosepiece may be a bit scary and following the direction of breathing in and out of the nosepiece can be too difficult for them. An appropriate dosage of medication is given in orange juice about 30 minutes before treatment. This is a quick-acting medication which makes the child quite drowsy. It is very safe. They will need assistance to get home and it wears off over about 3 hours. Often the child will have absolutely no memory of the treatment. 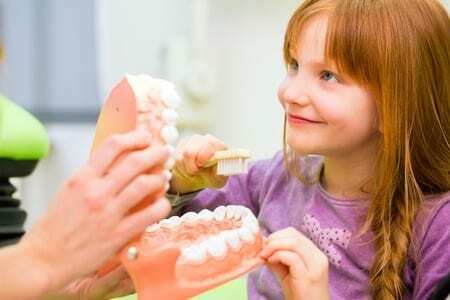 If your child will be given oral sedation, lease arrive 30 minutes before the appointment so that the medicine can be given and allowed time to act. If you arrive late, then the appointment may have to be rearranged as it is important that your child’s treatment is not rushed. Please do not bring other children to the sedation appointment. Your sedated child will require your full attention. Please also be aware that your child will require close supervision after the procedure as they will be unsteady on their feet. We provide wheel chair assistance to your car after the appointment. Please ensure you have arranged private transport after your appointment, as a bus or train is unsuitable. For some children, we refer them to a specialist paediatric dentist. This may be where all other simpler forms of treatment have been unsuccessful. Sometimes there is so much treatment needed, it would be kinder to have it all simultaneously performed under a general anaesthetic in hospital by the specialist. Please click here for our costs and rebates including Medicare’s Child Dental Benefits Scheme.